When you spend money on digital advertising, you want to know it’s working for you. If a user clicks one of your ads (from any medium – Google, Bing, Facebook, email, etc. ), you want to know where that user came from and what actions they took on your website after clicking the ad. To track performance like that, you need to place tracking directly within your website source code as a separate data layer. This can be very confusing and risky if you don’t have programming experience. 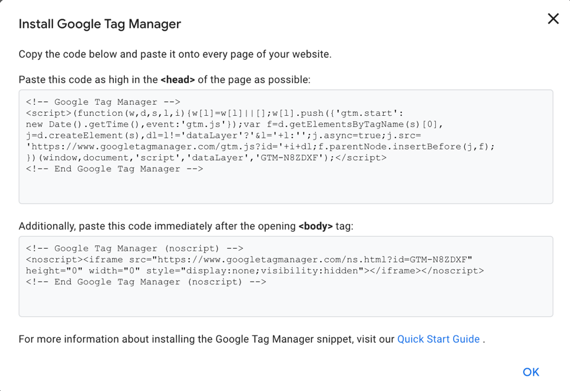 That’s where Google Tag Manager (GTM) comes into play! GTM is a code injection tool that allows advertisers to set up tracking tags on their website, which then transmit data to third-party data collection software (like Google Analytics) for marketing analysis. Within Google Tag Manager, you’re able to specify certain actions on your website that will “trigger” a conversion tag to provide attribution to your digital campaign. Now if you read that paragraph and have no clue what we’re talking about, we’ll try to break it down. In this case, a tag is a piece of code placed on your website to collect data and send it to third parties (like Google Analytics). Tags can be used to track a wide variety of user actions, such as viewing a key page on your site, submitting a form, downloading a PDF, scroll tracking or … you get the idea. Once you establish what actions will trigger your tags, the user information goes on to a third-party data collector, who then aggregates your data so you can view it and report on the success of your campaigns. We’ve also mentioned “triggers” quite a bit, so knowing what these are and how to set them up is very important. Triggers can range from a specific click on your site to landing on a particular page. For example, if you have a “Contact Us” form on your site and you want to know what ads drove people to complete that form, you’d want to set a trigger on the form’s “Submit” button or the “Thank You” page that form redirects to. Basically, triggers tell your tags when to collect information. All clear? Great! Now that you have a basic understanding of what goes on in the background, you need to know how to set this up on your website. A GTM Container is where all your tags live. Placing your container is the one time you need to go into your website code, so you don’t have to later. You’ll notice two pieces of code that need to be placed on your site – one piece in the <head> section of your source code and one piece in the <body> section of your source code. Once they are placed correctly, you can then preview all actions taken on your website to create your tags and triggers. If they are placed incorrectly, you won’t be able to track any actions taken on your site. Okay. What if I’m not doing any advertising? Funny you should ask! GTM is used to track website traffic across all mediums – whether that be from digital ads or organic traffic. You may not have the budget to spend on a comprehensive digital advertising campaign, but you want to know if your website visitors are even seeing the products on your page or where they are exiting the user journey. Let’s say you have a certain product shown towards the bottom of your homepage, and you want to see how many people have viewed that part of the page. Within Google Tag Manager, you’re able to set up tags to capture scroll depth or page viewability. You can then set that tag up as a goal within Google Analytics to track specific conversions of users on your site. As you can see, GTM should be a staple in your website development, so you have a one-stop-shop to manage all your tracking efforts. Without using a tool like Google Tag Manager to track your advertising campaigns or organic web traffic, you’ll miss out on valuable insights into what kind of users visit your site and how to better market to them. We could provide hundreds of examples of how tracking benefits your business, but the first step is knowing how to manage it all. This product takes time to learn, and time is stretched thin when you have other business efforts competing for your attention. Managing the tracking yourself can be monotonous and even daunting if you’re unsure of what you’re doing. With a full-service agency to build your creative messaging and track the performance of that messaging from start to finish, you’ll have a clear understanding of how your advertising efforts provide valuable returns for your business. Contact us to get started.